Guillermo del Toro's last directorial effort was in 2008, the year that Hellboy II: The Golden Army was released. In the years since, the director tangoed with the idea of directing The Hobbit, tried his hardest to get At The Mountains of Madness made, and produced a few movies like Mama, Don't Be Afraid of the Dark, Megamind and Rise of the Guardians, but spent all that time away from the director's chair. Finally, however, the wait ends this summer. 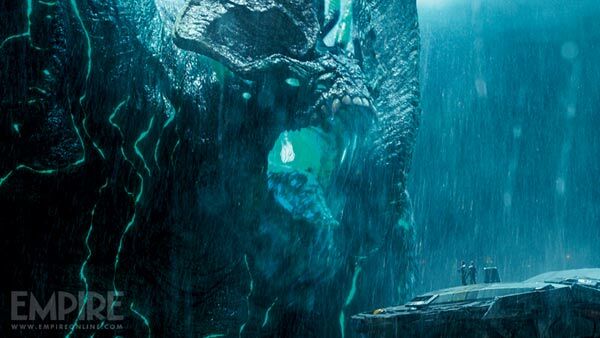 This July del Toro will deliver some giant monster vs. giant robot action in the form of Pacific Rim, and we couldn't be more excited. And these two new stills certainly do nothing to hamper that feeling. As you can see above and below, Empire has gotten their hands on two new images from the upcoming sci-fi epic, and they do quite a good job showing off the ridiculous scale of the movie. 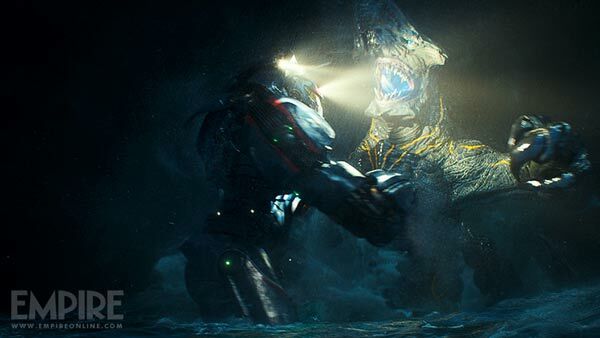 In the first still up top we see one of the human race's robots, known as Jaegers, going head to head with an other-worldly beast, called a Kaiju. Cool as that first image is, it's this second one that I find truly awesome. If you look closely at the bottom right-hand side of the still below you'll notice that there are a couple people standing in front of that roaring behemoth. It gives us a great sense of just how horribly big these creatures really are. Based on a script by del Toro and Travis Beacham, the film stars Charlie Hunnam and Rinko Kikuchi as a pair of Jaeger pilots, the former a washed up veteran and the latter a trainee. When the chips are down and the world is close to succumbing to the giant inter-dimensional creatures that have erupted from the Pacific Ocean, the duo is forced to work together and operate a Jaeger that is believed to be old technology. Look for Pacific Rim in theaters on July 12th.